Years ago, I have taken a free mail service, mail-online.dk, because I needed a second mail address for registering some programs etc. I have taken this account also for playing an online game. Now, 14 days earlier, mail-online.dk informed me, that it's not free anymore, instead, I have to pay approx. 7 Euros per month, and I have to take at least 6 month at once. This change will be effective from January 1st 2014. Regardless of the real short warning period, the minimum period of time I have to purchase (6 month!) and with that exorbitant high price. So I got a new problem, because my game vendor are not willing to change the email address of the game account in a few days. In fact, I am not sure they will change it fast enough, and then I can't receive any confirmation mails anymore. The maliciousness of this is, that both, mail provider and game vendor, will not work hand in hand and so the only one who will be spoofed is me. I guess the game vendor has enough players so they are not interested in keeping customers (who paid money for the game) anymore. Unfortunately that game was the only one I got some fun while playing at the moment. The bottom line: Do not trust in free mail providers. P.P.S. : I managed to tranfer my above mentioned game account. It's now tied together with a new mail-account - but not a "free" mail-account anymore, and no, not an expensive danish one. See http://www.cbmstuff.com/proddetail.php?prod=SCP for more details. Now you can buy the Supercard Pro and there is already a bunch of implemented features. The SuperCard Pro software is still a work in progress, it will be updated continuously. New file formats will be supported soon (e.g. often used floppy disk formats) hopefully. Stay tuned to hear again from them soon. You will notice a slightly less acceptable graphics quality, although it's also good playable. For you all without a real Sega Genesis console, try it online at ssega.com. This site provides you a full access to all known Sega Genesis Games but without the need of installing any emulator. Really nice, isn't it ? 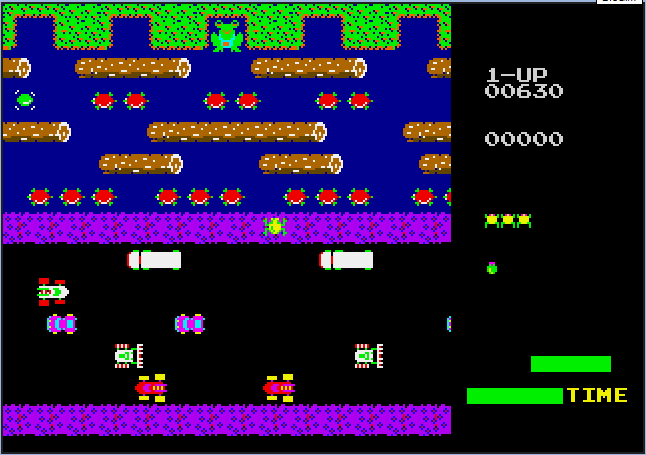 For a comparison, see my other blog entry about SNES Frogger. This calculator was a milestone in terms of programming capabilities, but not a success. 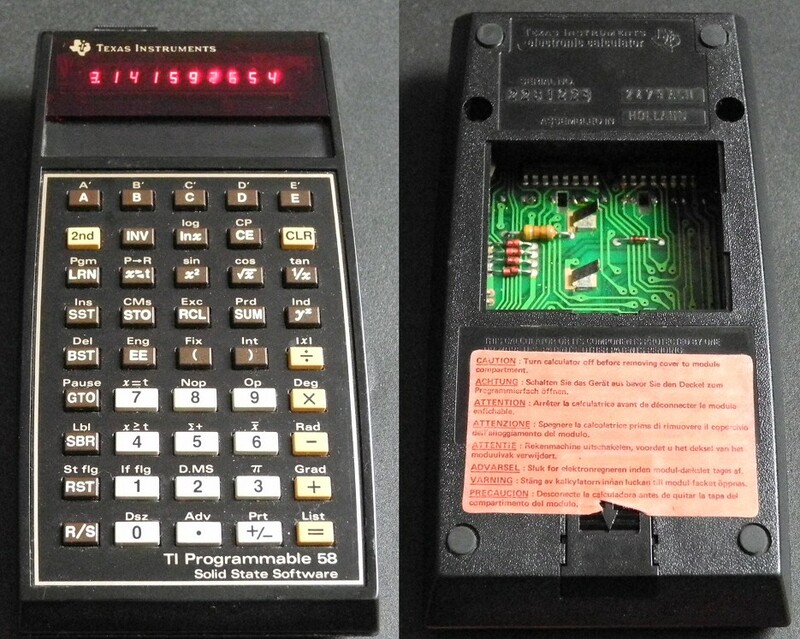 It was soon (1.5 years later, 1979) replaced with a similar calculator model but with a persistent memory - the TI-58C. There was also a big brother with more memory and a magnetic stripe reader, the TI-59. Both can be upgraded with special modules, e.g. a mathematics cartridge, or even custom roms for aviation. Compared to other TI calculators of the same era, battery compartment is different (see the two latches/clips inside), battery pack BP-1A differs from comparable battery packs (e.g. for the TI-57) also. Don't miss the "cleaning a TI-59" page from Marek Czeszek if you're a collector of these wonderful devices. SNES (PAL) and a rare NTSC cartridge "Frogger"
Friends of casual games will remember one of the most famous classics: Frogger. For Super Nintendo (SNES), this game was selled only in the U.S. / Canada. So how can you play it with an european PAL-based SNES ? 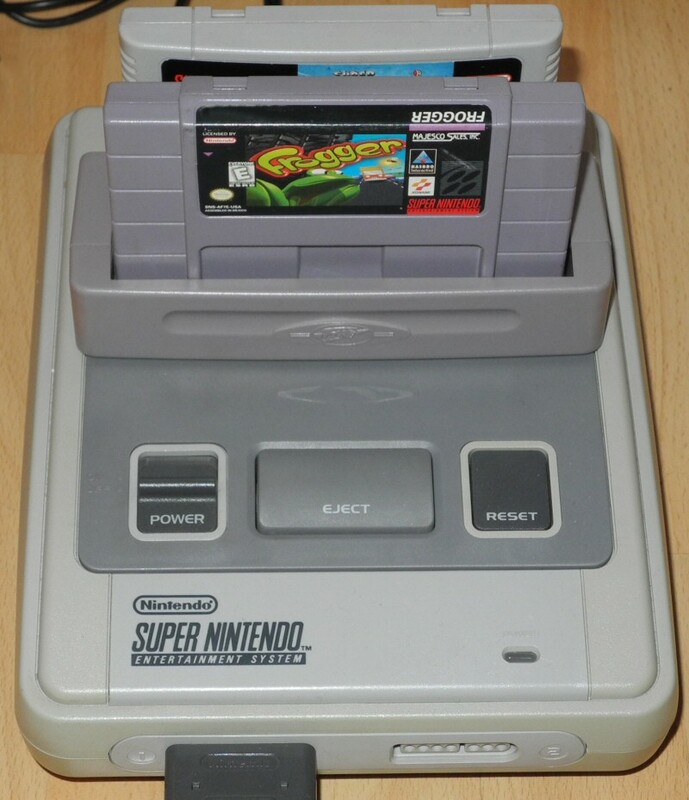 Easy, you need only an adapter, which reports a PAL cartridge to the SNES console, but make it possible to use another NTSC cartridge (see picture). 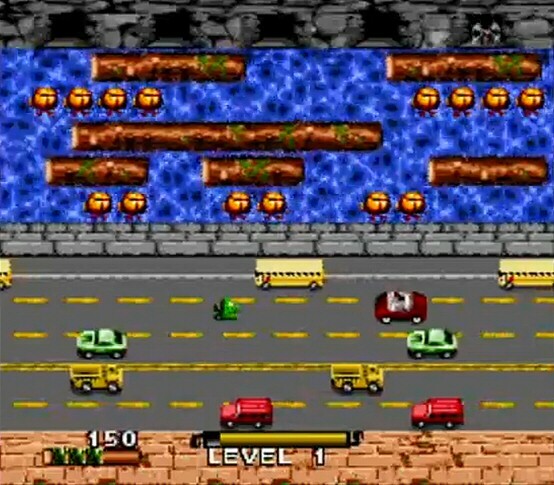 So one of the latest games for SNES, Frogger will run on a PAL SNES, too. It's a game without any surprises (except one, see later), but graphics are done good enough even for modern days. Anything else worth to be mentioned ? Yes, it's unbelievable, but this game does NOT save highscores persistent, every time you start the game after powered off and on, Highscores are resetted. Can be an empty/low battery. A bit disappointing.